must've stood once, or so I imagine. of introducing fox-hunting to Bombay. he felt the city badly needed. had fallen by the wayside. Dog in tow, Yudhishthira alone plodded on. to airlift him to heaven. to get on board unless dogs were allowed. I answer to the name of Ugh. but as in ghost, ghoul or gherkin. ﬁve hundred and ﬁfty-two verses). if you count the initial Om. Please don't ask me what it means, though. the powers of my mind. and is joined by his neighbours. to give an account of its leaves. at the sight of a cop. like a husband after late-night revels. its address in its pocket. and explodes in my brain. 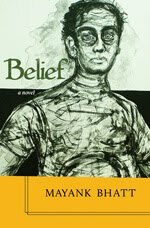 While most of the paper describes the reaction of the people in North Lakhimpur (in Upper Assam) to Jawaharlal Nehru’s death in 1964, and especially the devastation stemming from fear that Prof. Hussain’s maternal grandfather experiences, towards the end, he narrates his own efforts to make sense of an event that obviously had a great personal and public impact. Prof. Hussain narrates: “When we all went to bed at night I was very much disturbed. As a 12 year old child I was thinking of life after death. What would happen to Nehru in the aftermath of his death in the court of invisible Allah/God? “Our Moulvi Sahib told us earlier that only Muslims will go to heaven. Next morning when our Moulvi Sahib came to teach us how to read the Holy Quran, I raised a question before him. The Moulvi had quite hard opinions about religion. 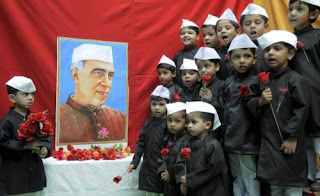 I asked him whether Nehru is going to heaven or not? The Moulvi was somewhat embarrassed. He wanted to avoid the question I raised. He asked me to concentrate on reciting the Quran. However, I was not relenting I raised the question again. The Syrian refugee crisis and the November 13 Paris attacks have once again focused the West’s attention on the Muslim Question. The abominable and reprehensible Paris attacks pushed to surface the subterranean resentment that western societies harbour against Muslims and Islam. The attacks clouded the West’s effort to provide humanitarian succour to the millions of refugees fleeing the Syrian civil war. The debate that should have focused on humanitarian objectives such as providing safety to the fleeing millions, turned into fear-mongering, and resulted into devising means to delay if not altogether prevent the influx of the refugees. Arguments such as ‘why the Arab states aren’t offering aid’, to ‘the Arab world need to fix its problems’, and statements such as ‘what if ISIS terrorists pretend to be refugees and infiltrate western societies to wreak mayhem’, to ‘western societies should have a right to choose who it should take in’, were (are) being made not merely in everyday conversations, but even in policy-making forums. Canada emerged with dignity from a particularly brutish election campaign where the Conservative Party of Canada led by Stephen Harper focused on portraying Canadian Muslims as a threat to Canadian values. Justin Trudeau’s sweeping victory may provide temporary relief to the embittered Muslims of Canada, but unless the new Liberal government resolves to undertake substantive measures to rectify inherent biases, no far-reaching, long-lasting systemic changes should be anticipated. 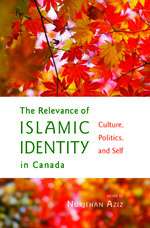 The Relevance of Islamic Identity in Canada published by Mawenzi House and edited by Nurjehan Aziz analyzes critical issues pertaining to Islam and Muslims. (Disclosure: My essay ‘Married to a Believer’ is in this anthology). The essays in the volume discuss nearly every aspect of the Muslim identity, and how it impacts and is impacted by Canada. The collection is a great mix of the personal, the academic, and the polemical; all the 11 essays address the issue of identity, and what it means to be a Muslim immigrant. 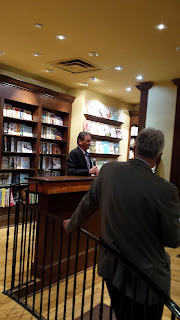 The volume offers a rich diversity of opinions, reinforcing the fact that Islam in Canada is multicultural and varied. 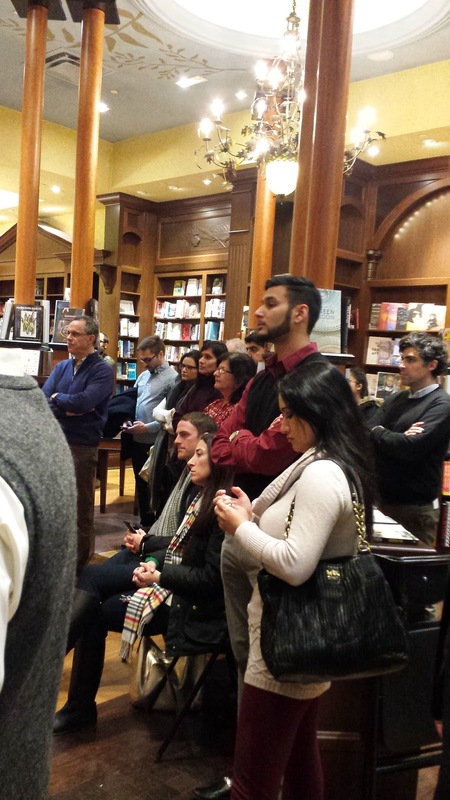 The three essays that contribute original though on the issue of Islam’s place in Canada are by Monia Mazigh (Reexamining Relations Between Men and Women); Haroon Siddiqui (Anti-Muslim Bigotry Goes Official – Canada’s Newest Dark Chapter); and Mohamed Abualy Alibhai (The Future of Islam in North America). Across the developed world, a debate that has been gathering momentum and seems to be on the verge of taking over public discourse, is the flagrant and growing inequality in these societies. Inequality is no longer merely economic, although it is the economic dimension that seems to be the most obvious. For instance, in the United States of America, a country that even now retains its sheen as the world’s beacon of hope, a mere one percent of the rich control 80 percent of its wealth. From a democracy, the US (and, for that matter, most of the developed world) seem to be veering away to plutocracy where the rich have become the occupying force that arm-twist the apparatuses of the state to suit their ever-increasing greed. A growing band of activists have persistently raised awareness of the masses by asking inconvenient questions and telling truthful tales that are at once shocking and hair-raising. For instance, corporate America indulges in wage theft to the tune of $106billion, by making workers labour more hours but paying only for regulation hours. And that while corporate America continues to resist the implementation of $15 an hour minimum wage, the minimum hourly wage required for bare minimum, subsistence existence as determined by Massachusetts Institute of Technology (MIT). Barbara Ehrenreich is among those activists who have consistently spoken out loudly against the inherently unjust system that has been created in the last four decades in the United States. Author of over 20 books, Ehrenreich was in Toronto to deliver a special lecture under the aegis of the F Ross Johnson-Connaught Speaker Series organized by the Munk School of Global Affair’s Centre for the Study of the United States. The program was titled An Evening with Barbara Ehrenreich: Inequality in the United States. Unrelenting, scathing and sarcastic, Ehrenreich lambasted the present state of the United States where poverty is treated as a character failing. “Poverty is a shortage of money. It is not a character failing,” she declared. The author of Nickel and Dimed: On (Not) Getting By in America (2001), and Bright-Sided: How Positive Thinking Is Undermining America (2010) castigated the overwhelming tendency of the police in the US to victimize the African American minority, including minor school girls. Describing the police as an occupying force, she said that police harassment of the blacks and minorities has actually increased manifold after the economic downturn because it has become a major revenue earner for the law enforcement agencies. 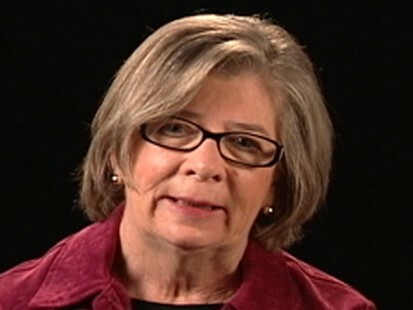 An honourary co-chair of the Democratic Socialists of America, who also serves on the NORML Board of Directors, the Institute for Policy Studies Board of Trustees, Ehrenreich said it was time fundamental changes were introduced that would skew the balance in the favour of the poor, who at present seemingly have just two choices – destitution or incarceration, which is a direct result of the criminalization of poverty. Regulating the untrammeled flow of money into politics, which results in policy formulations that favour the rich. Before becoming an activist, she studied cell biology and physics, graduating with a degree in physics from Reed College in 1963, and a Ph.D. in cell biology from Rockefeller University in 1968. 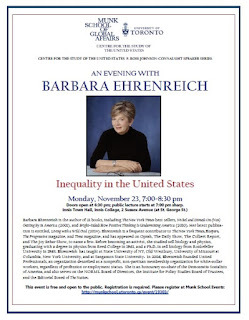 Ehrenreich has taught at State University of NY, Old Westbury, University of Missouri at Columbia, New York University, and at Sangamon State University. In 2006, Ehrenreich founded United Professionals, an organization described as a nonprofit, non-partisan membership organization for white-collar workers, regardless of profession or employment status. Her latest publication is entitled, Living with a Wild God (2014).